The recently introduced Universal apps for Windows are a significant improvement on the previous level of code sharing available across XAML platforms. For the first time you can share not only PCL compliant .NET code but also a significant amount of XAML, and additional UI related assets like language resources. For MVVM apps this now can mean adding sharing of Views on top of shared Models and ViewModels that can be created with today’s PCLs. Creating a Universal app starts with creating the new project type, in this case I’ll pick the Blank template. 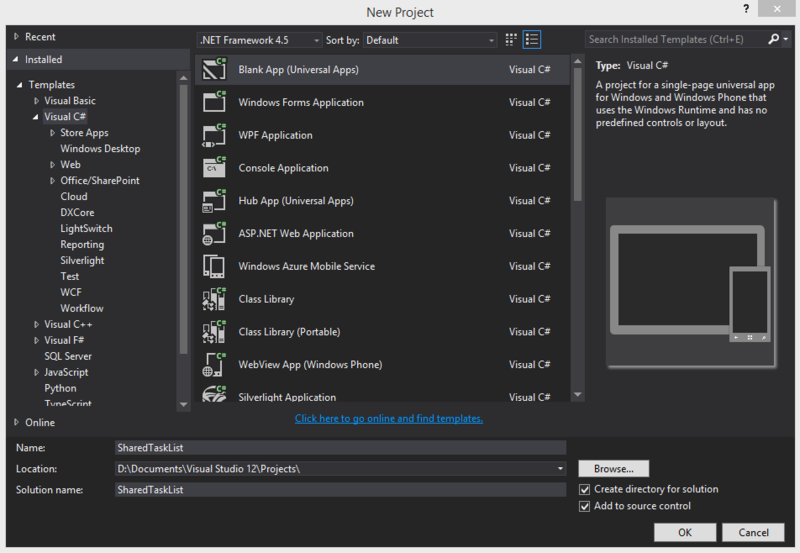 From this template, you will get not one, but three project nodes created for you: the Windows 8.1 Modern app, the Windows Phone 8.1 app, and a completely new type – the Shared project. They’re all placed in a Solution (and also physical) folder to keep them together.